Fresh Pineapple Water is another amazing tasting infused water! If you have been following me then you will know about my infused water obsession and my eternal pineapple love. Pineapple infused water can be commonly found bottled all over Europe, yet nothing beats a DIY homemade ananas water. Pineapple Water is water flavored with fresh pineapple chunks. The fruits are left to infuse in clear water so that the water takes up the flavor and nutritious elements of the pineapple chunks. The same can be achieved with other fruits, whereas some fruits are more suitable than others. My most recent fruit infused water was this gorgeous looking fresh strawberry infused water. If you are asking yourself what the difference is between fruit infused water and a fruit juice, then take a look a the strawberry water post, as I explain this further over there. 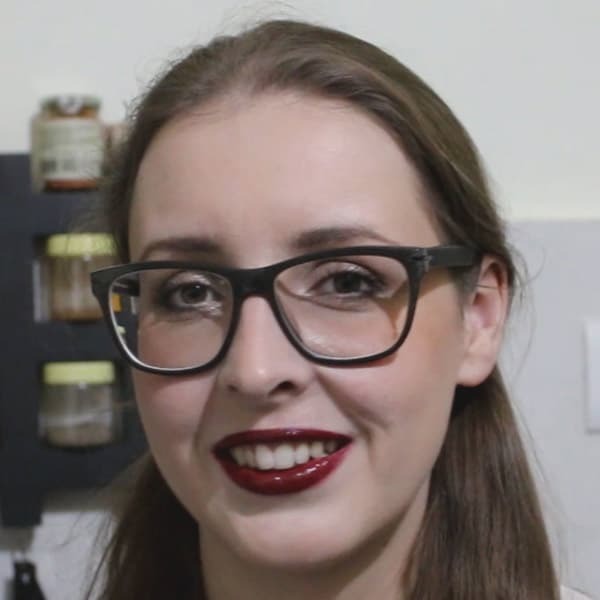 How to make Pineapple Water? To make pineapple water you can use fresh pineapple chunks from a whole fruit. 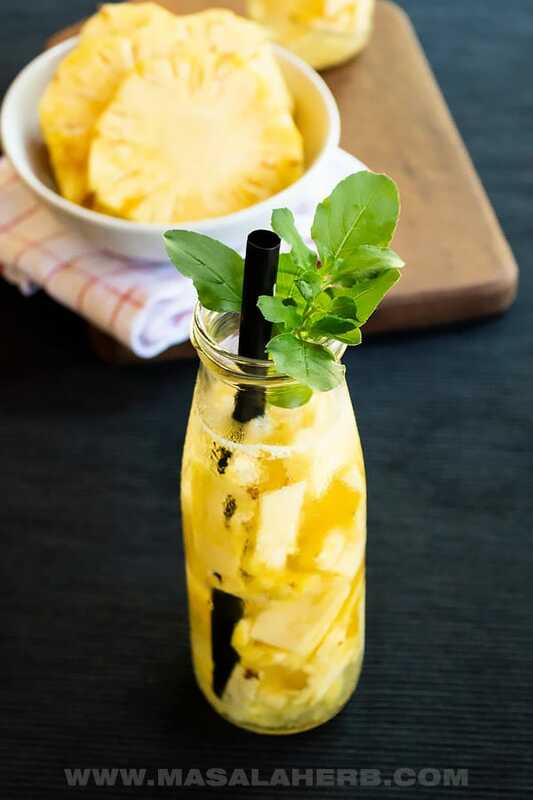 You can use canned pineapple chunks but it wouldn’ t be the same because for one, they add sugar, and secondly nothing beats a ripe fresh pineapple to make this pineapple infused water. The best part is that you can choose the amount of fruit you want to add to your pineapple water. The more you add the more flavorful it can get. Of course, picking the right pineapple is another plus point (more about how to pick the right pineapple further below). At the same time, choose if you want to make a bigger batch of pineapple water to please a bigger group or if you are planning to make this for yourself only. You can do both! To make a bigger batch of pineapple water, use a pitcher. 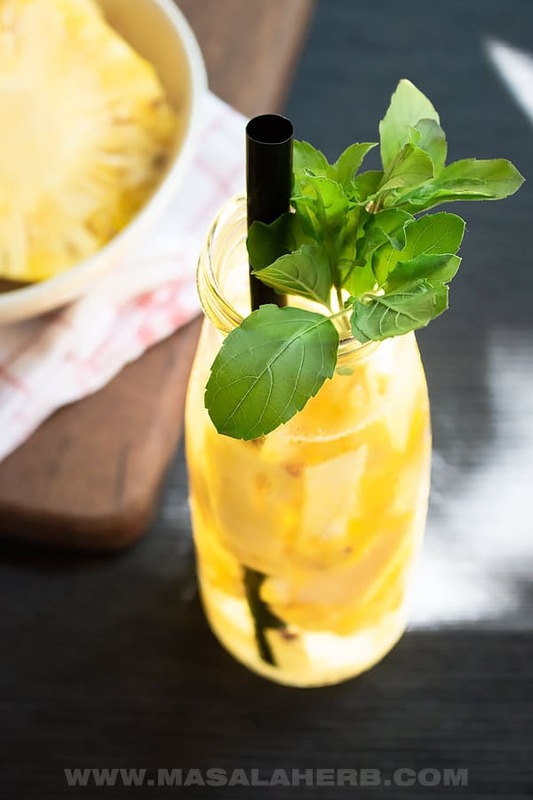 To make pineapple water for yourself, use a glass or even better something like a mason jar or small milk glass bottle because then you can close the glass with a lid while the water gets infused with the pineapple. I recommend the lid option because of hygienic reasons. I explain in more detail, your container options to make fruit infused water, in my strawberry infused water post. Besides, you get to refill your glass once you have enjoyed your first batch of homemade fruit infused water! That’ s the best part, so the fruits find use not just once. I usually refill my bottle at least 3 times in the course of a day. So, the first time the pineapple infuses really quick because the fruits are fresh and new. Therefore, I keep the pineapple to infuse for about 30-60 mins the first round. The second time and third time (or even fourth round), you can keep the fruits to infuse a little longer. That is up to you how you like it. Also, you can also infuse the pineapple chunks for one round and then eat the pineapple chunks. I usually love to refill my bottle with fresh water and at the end, I just add the drained lifeless pineapple chunks to my compost. What pineapple to pick for the pineapple water? To pick the right pineapple you need to look, touch and smell the fruit. The pineapple should be ripe looking. This, of course, depends on the pineapple variety because some are not yellow on the outside but with a pinkish hue, yet generally speaking if the pineapple is yellow, it’ s a good sign. The pineapple should be firm and not soft, the crown should be deep green as this is a sign of vitality. Pick a pineapple without spots or damages. After I have determined the outside looks, I get into a smell mode. You need to smell your pineapple and the strongest fruit smell comes from the bottom of the fruit. Go after your nose, the sweeter the fruit smells the better the pineapple will taste. A really good whole pineapple will turn your kitchen into a tropical coco loco beach because the fruit aroma just takes over the whole surrounding. I found this article about picking the right pineapple from the new york times (from 1982!) interesting. A refreshing pineapple water beverage, sugar-free and natural. Cools you from within. 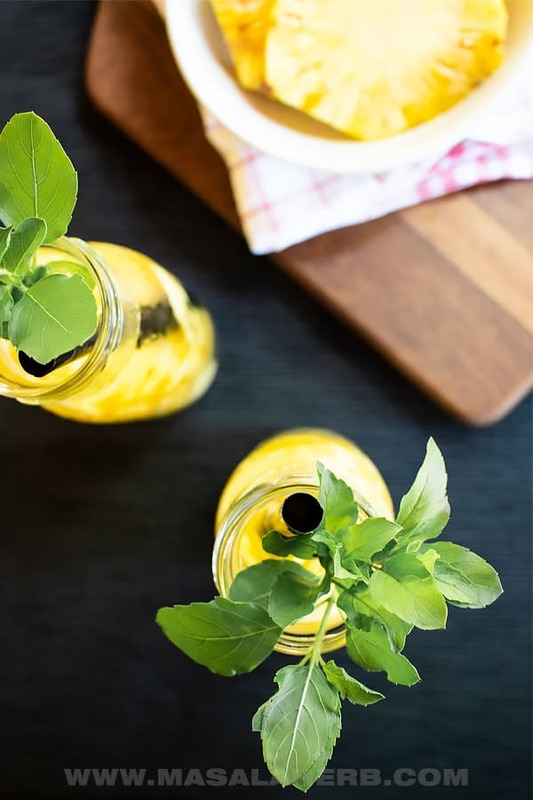 use a tall glass jar such as milk bottle glass jars so that you can close the glass too for hygienic reasons. or a portable fruit infuser bottle infuser. Peel and cut your pineapple. Place as many pineapple chunks as you want into your glass/jar/bottle. The more you add the more flavorful your water will be. Just make sure that there is enough space to add water to infuse. You can enjoy the first round already after 30 minutes. Refill again up to 4 times max with fresh cool water and let the fruits infuse each time again before enjoying the strawberry infused water. Dear Reader, which container are you planning to use to make this pineapple water? Would love to be sipping on a glass of this right now! What a great idea to use pineapple. Love this Helene! 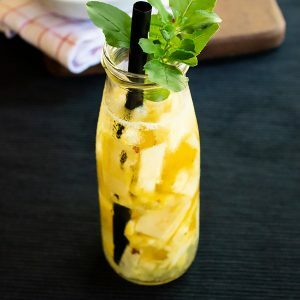 Hi, this may be interesting you: Fresh Pineapple Water [DIY]!